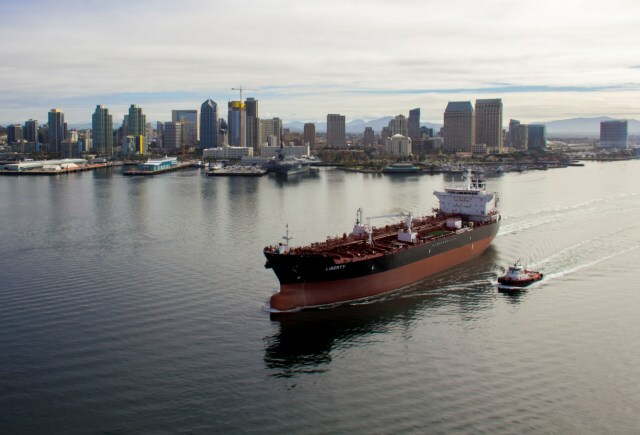 General Dynamics NASSCO delivered the Liberty, the third and final ship to be constructed for SEA-Vista LLC as part of a larger eight-ship ECO Class tanker program. In 2013, NASSCO entered into an agreement with SEA-Vista to design and build three 50,000 deadweight-ton, LNG-conversion-ready product carriers to include a 330,000 barrel cargo capacity each. The 610-foot-long tankers are a new “ECO” design, offering improved fuel efficiency and cleaner shipping options. Construction for the first of the three ships for SEA-Vista LLC began in November 2014. The first two ships—the Independence and the Constitution—have been delivered and are servicing the Jones Act trade.